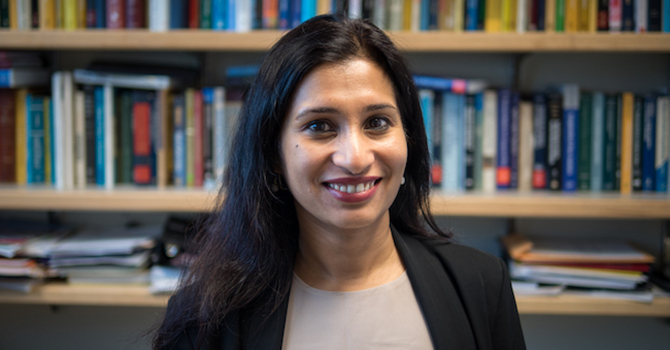 Bhramar Mukherjee was recently named chair of the Department of Biostatistics at the University of Michigan’s School of Public Health. She is the first woman to hold the position since the department was founded in 1949. Mukherjee’s principal research interests lie in electronic health records, modeling health effects of multiple pollutants and environmental mixtures from big data, Bayesian methods in epidemiology, and studies of gene-environment interaction. She has served as associate director for cancer control and population sciences at U-M’s Rogel Cancer Center since 2016. She also is the founding director of U-M’s undergraduate Big Data Summer Institute. Mukherjee spoke about balancing research and being a single parent and her passion for math and big data. You come from an illustrious family of artists in India. What did your parents think of your decision to follow math? Mukherjee: My parents never really understood what I was doing and what excited me in the maze of numbers and equations. I do not think till this day they have it quite figured out what I do for my day job. However, they ensured that both my sister and I had a broad-based liberal arts education and were raised as strong and independent individuals. I think their respect for us even when we were young was critical to finding my own path without any influence or external pressure. I quit engineering after a week of class and chose the less glamorous and lucrative vocation of statistics in terms of the Indian societal perspective but my parents did not say a thing. They always believed in us, in our successes and in our failures. What was most challenging and most rewarding part of balancing work and home, especially being a single parent? Mukherjee: The most challenging part was traveling. Every time I got invited for a lecture I had to find an overnight nanny. That is difficult and expensive as a single parent. On the other hand, because I could not leave my daughter alone over the summer, I took my daughter around the world when I was speaking at conferences. We traveled to Asia, Europe, across North America. She is a well-seasoned traveler and started to count her frequent flyer miles at a very young age. I guess this was one of the secondhand but positive side effects of being a single parent. I was able to give her a global exposure and we both enjoyed exploring unknown cultures together. My colleagues and students at U-M helped out with parenting whenever I needed support as I have no family in North America. This university community has become my family over the last 12 years. This job is not just a job. What this institution represents to me is deeply personal and meaningful. Your career has evolved over time. What is the most exciting thing about being able to do it? Mukherjee: Academia is like democracy. It is not perfect but there is no better alternative, at least for me. I always say to my students to indulge in curious failures. Yes, curiosity killed the cat. But the cat has nine lives. I am on my seventh one. Being an eternal student is the best part of being in a university like Michigan. I am constantly stimulated by new knowledge, new discoveries and challenges. I experiment in my teaching, advising and research continuously. Every time you feel you are closer to your goal, the horizon moves further away. That is the beauty of science. People say that women have to work harder especially in science. Did you ever feel so? Mukherjee: I work very hard. I have always worked very hard. I do not know if my gender has anything to do with the insane amount of hours I have always devoted to work. I feel obsessed when I want to achieve something and I just cannot stop working till I know the answer. I think hard work is important for everyone, regardless of how smart you are, for a man or a woman. As a scientist, I would rather meet a higher bar and have my work be harshly criticized and scrutinized than people being polite. What bothers me most is when I perceive a patronizing and gentle attitude because there is a paucity of women in our field. I want to be treated as a scientist. In a brutally honest, fierce, animated way. Period. What advice would you give someone starting out in this field? Mukherjee: Biostatistics has been a spectacular discipline for me. 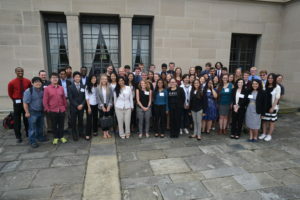 I could never imagine a field where the quantitative side of my entity connects and communicates so well with my social side. Modeling is an art and a science. I have really enjoyed my role as the associate director of cancer control and population sciences at the Rogel Cancer Center, a path less traveled by a statistics Ph.D. I am excited to be living at a time where we are truly practicing science without disciplinary boundaries. 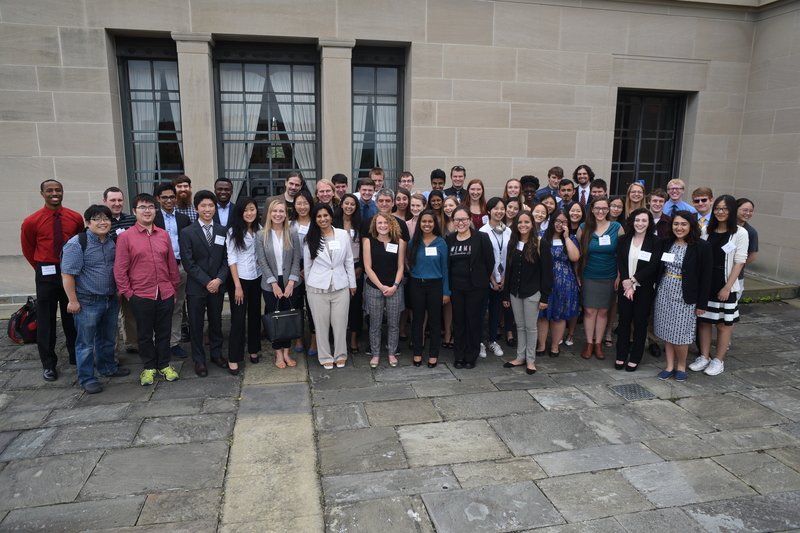 I started the undergraduate Big Data Summer Institute in 2015 with support from the university and we have trained 164 undergraduates in the last four years. Sharing my own joy with the next generation has been empowering and fulfilling. I will tell the next generation exactly what I told the 44 students that recently started the program: I encourage you to fail. The twists and turns make the journey, not the mere destination. I have danced to the beat of my own drums, even if I missed a step or two.